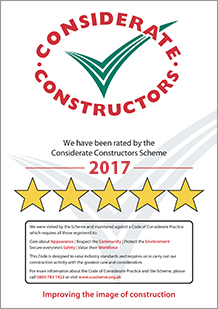 Once a supplier has received their confirmed score for the year (following the completion of all required validation visits), they will be issued with a star rating and a certificate. Star ratings give suppliers an opportunity to promote their considerate performance in an easy to understand, visual way to clients and the public. Star ratings range from three to five, with half stars in between. They are based on the confirmed score that is issued by the Scheme once all visits have been conducted. Suppliers will receive a star rating in every registration period, as long as the required visits have been conducted. Other star rated products are also available to help suppliers looking to promote their achievements.